I’m very particular about my chocolate chip cookies insofar as they must be perfect. And sure, sometimes anything with butter and chocolate will do… but also, life is too short to be futzing around with disappointing cookies. For my tastes, a cakey chocolate chip cookies can take a long walk off a short pier ;a soggy endeavour to be sure. The rules of cookies engagement state that chocolate chip cookies must be gooey towards the center and buttery crisp around the edges. Unless of course, you’re turning your chocolate chip cookie into something donut-shaped and glazed, in which case cakey is a go. Listen, I don’t make up the rules, I’m just here to nag you with them. (Also… I totally make up the rules). In an effort to turn our favorite dessert into our other favorite dessert, our cookies have gone donuts. Added bonus, I used the word ‘insofar’ and it felt pretty fantastic. We’re making baked donuts which has two requirements: a baked donut pan (I went mini this go-round) and Browned Butter. If you’re new to the ways of browned butter, here’s how to be part of the magic. Before the doughnut batter comes together, we start with the topping layers. The crumb topping! It may feel counter-intuitive, but this buttery, sweet, sandy mixture comes together on the stovetop. Melt butter, stir in sugar, cinnamon, and salt… then work in the flour creating a sandy crumb. Allow to cool before adding the mini chocolate chips. This glorious crumble tastes just like chocolate chip cookie crumbs! This is a small batch recipe, creating 6 regular size baked donuts or 12 mini baked donuts. Flour, baking powder, baking soda, a hint of cinnamon, and brown sugar to make our cookie cake batter. I melted all of the browned butter at once. We’ve got browned butter going into the donut batter and into the sweet glaze. For the donut batter: milk, egg, browned butter, and vanilla. Stir the wet into the dry ingredients. This is a friendly batter. Nothing too complicated. Mini chocolate chips because they’re exactly precious enough for these little donut bites. Into the mini donut pans and ready for the oven. We’ve got two pans and just enough batter to fill both. This recipe is easy to double depending on how many you need to feed. While the donuts bake, we stir the chocolate chips into the cooled crumble topping, and whisk together the brown butter glaze. If you find that your chocolate is melting in the crumble topping, just pop it in the freezer to fast chill. Baked, cooled, and ready to dip and top. Flip these donuts from the pan and frost the smooth round side. An assembly situation: dipped in glaze and sprinkled generously with crumb! The mini donuts are two bite wonders. I like them still warm with melted chocolate insides. The batter isn’t too sweet but hold up well to the chocolate and sweet glaze. Cookie donuts and we’re not even sorry! To make the crumble, melt butter in a small saucepan over medium-low heat. Stir in the brown sugar, cinnamon, and salt until just combined. Add the flour and quickly stir into the butter and sugar mixture. Continue to cook over low heat, lightly breaking up some of the larger bits until the mixture is thoroughly combined. The mixture will resemble wet sand. Cook over low heat for 3 minutes before turning out onto a plate to cool. Once mixture is cooled, toss in the chocolate chips. To make the doughnuts, place a rack in the upper third of the oven and preheat oven to 350 degrees F. Lightly grease two mini doughnut pans and set aside. In a medium bowl, whisk together flour, baking powder, baking soda, salt, nutmeg, and sugar. Set aside. In a small saucepan over medium-low heat, melt butter for the doughnuts and the glaze. Butter will begin to crackle and pop as it melts. That’s the water melting out of the butter. Once the water has evaporated the butter will quiet down and begin to brown. Keep an eye on it, it browns quickly. The butter will begin to smell nutty. Remove from heat and immediately transfer browned butter (brown bits and all) to a small bowl. In a small bowl whisk together egg, milk, and vanilla extract. Measure out 2 tablespoons of browned butter and whisk into the wet ingredients. Add the wet ingredients all at once to the dry ingredients. Stir together until no flour bits remain and all of the ingredients are well combined. Fold in the chocolate chips. Try not to overmix the batter. That might create rubbery doughnuts. Place in the oven and bake for 6 to 8 minutes for mini donuts, 8 to 10 minutes for regular baked donuts. Keep an eye on them and try not to over-bake them. Remove from the oven and allow to cool in the pan before inverting onto a wire rack to cool completely. To make the glaze, in a medium bowl whisk together powdered sugar, salt, butter, milk, and vanilla extract until smooth and juuust pourable. Add more milk or powdered sugar as necessary to adjust consistency. To assemble the doughnuts, dip the doughnuts in the glaze, shake off excess, cover with crumb topping and allow to set for 15 minutes before serving. Donuts are best served within 2 days of baking. I love your donut recipes. I have to make them every time my granddaughter comes to visit. She can go through the whole batch in less than a weekend. I am anxious to make the mini chocolate chips ones for her. Oh my, these look and sound AMAZING. I cannot wait to make these!! The only decision is – before my 21 day fix, after my 21 day fix, or both? 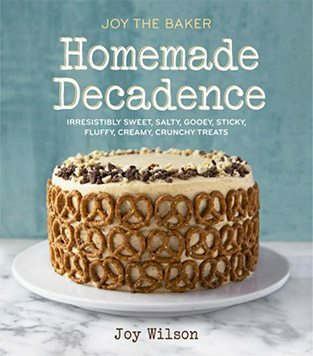 First thought after reading “small batch”: “oh good, they won’t go stale!” Second thought: “but this probably means I’m going to eat them all!” Thanks for sharing, Joy! That really looks amazing. I must buy myself one of those mini donut pans. It seems so much easier than frying. This definitely cranks up ye olde sweet tooth! Can we put people in the freezer to fast chill? Looks delicious! Must buy a donut pan soon! Haha, I love your rules and am completely willing to comply……….especially when there are plenty of donuts involved!!! !